***Susan's Note: I used organic free range beef from Wegmans for this recipe, and I used applesauce instead of apple juice because that's all I had. I also added a bag of pre-cut Mirepoix from Wegmans. I am usually not a slow cooker user because I always have to have the food cook longer than it states on a workday because I am gone up to 10 hours during the day. This cooked for 9 hours on low and it was delicious. Tie a piece of thread or kitchen twine around the thyme sprigs and place them in a 5- to 6-qt slow cooker. Add the chicken broth, apple juice, carrots and onions and mix to combine. Season the beef with 1/2 tsp each salt and pepper; sprinkle with the flour. Add the beef and any excess flour to the slow cooker and mix to combine. Cook, covered, until the beef and vegetables are tender, 7 to 8 hours on low or 4 to 5 hours on high. When the stew has 10 minutes left to cook, heat the broiler. Place the bread on a foil-lined broiler-proof baking sheet. Sprinkle with the cheese and remaining tsp thyme. Broil until the cheese starts to brown, 1 to 2 minutes. Spoon the stew into bowls and top with the Gruyère toasts. 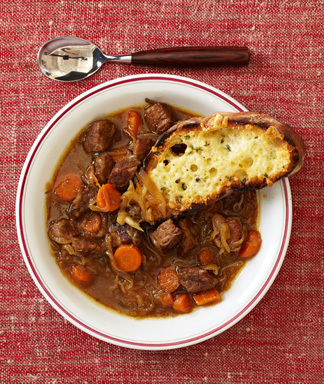 To make ahead, refrigerate the stew for up to 4 days or freeze for up to 2 months. Thaw, if frozen, then reheat, covered, over medium heat. Make the toasts just before serving. In a large nonstick skillet, cook bacon over medium until crisp, 8 minutes. With a slotted spoon, transfer bacon to paper towels to drain. Add 1 tablespoon oil to skillet. Add onion, carrot, celery, and garlic and cook until vegetables are tender, 15 minutes. Transfer to a medium bowl. Add 1 tablespoon oil and turkey to skillet and cook, breaking up meat with a wooden spoon, until almost cooked through, 5 minutes. Add bacon, vegetables, tomatoes, and pinch of red-pepper flakes, if using, to skillet and bring to a simmer; cook until turkey is cooked through and sauce is thickened, 5 minutes. Season with salt and pepper. Serve over spaghetti squash and sprinkle with Parmesan. 1. Heat 2 teaspoons of oil over medium heat. Add minced garlic and saute for 1 minute. 2. Stir in the black beans, salsa, brown sugar, worcestershire sauce, dijon mustard, cumin, and salt. Bring the mixture to a simmer, cook for 10 minutes. 3. Spoon the mixture onto whole wheat buns. If desired, top with shredded cheddar cheese. ***Note from Susan: A baby has arrived in our house! 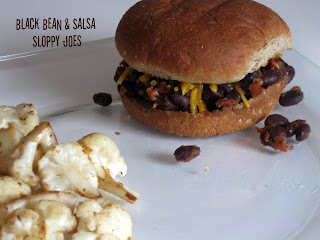 So I am adding some recent "simple" meals onto this blog. I have no time to make sides or salads, so "one pot" type dishes are perfect. This is a good example. If you don't have fresh basil (I didn't), I used dried and it was fine. Also, I didn't have smoked salt, though I would like to try that. I added 1 lb. of cooked ground turkey to add protein. 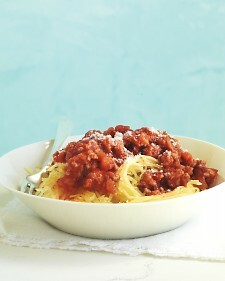 Giada: My mom loves this dish as a vegetarian main course, and Todd loves it when I add some ground beef to the mix. Either way, I've been on a "smoky" kick lately, exploring different ways to integrate this distinct flavor into recipes. In this one I use smoked salt. 1. Place tomatoes in a large nonstick skillet over medium-high heat. Cook, shaking the pan occasionally, until tomatoes are tender and the skins are charred in spots, about 10 minutes. Set aside to cool. 2. Bring a large pot of salted water to a boil. Add orzo and cook until tender but still firm to the bite, stirring occasionally, 8 to 10 minutes. Drain and transfer to a large serving bowl. 3. In a blender, puree tomatoes, basil, vinegar, olive oil, honey, smoked salt, and pepper. 4. 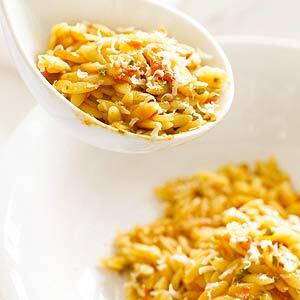 Pour tomato vinaigrette over pasta and toss to coat. Sprinkle with Parmesan. Serves 4 to 6.